Nope, not another sexology post. It’s actually about making a belt. You Don’t Have To be Good To Have Fun! IF YOUR job or hobby is deep-sea diving or jet-plane piloting, either you’re good or you’re dead. Watchmaking and diamond cutting call for considerable skill, too. But there are dozens of pursuits less exacting that offer something much needed these days: the thrill of accomplishment. I have an idea that a lot of people hesitate over hobbies because (a) they think they aren’t skilled enough, or (b) it’s too much work. 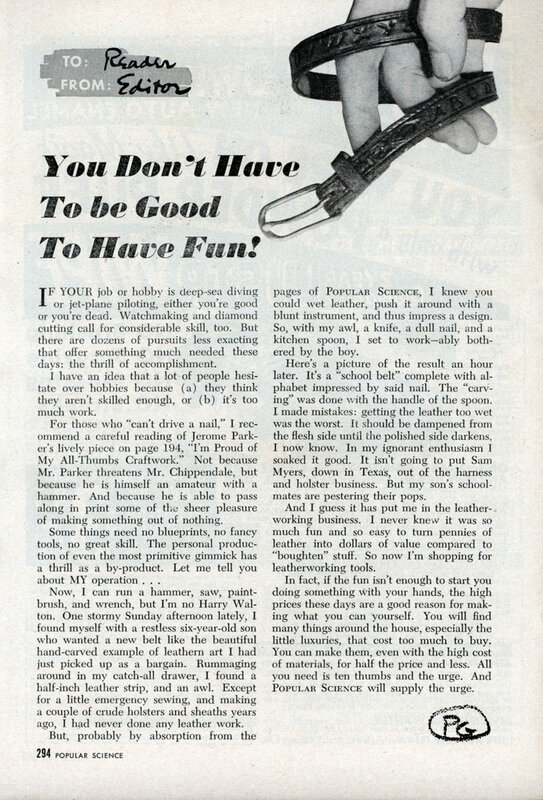 For those who “can’t drive a nail,” I recommend a careful reading of Jerome Parker’s lively piece on page 194, “I’m Proud of My All-Thumbs Craftwork.” Not because Mr. Parker threatens Mr. Chippendale, but because he is himself an amateur with a hammer. And because he is able to pass along in print some of the sheer pleasure of making something out of nothing. Now, I can run a hammer, saw, paintbrush, and wrench, but I’m no Harry Walton. One stormy Sunday afternoon lately, I found myself with a restless six-year-old son who wanted a new belt like the beautiful hand-carved example of leathern art I had just picked up as a bargain. Rummaging around in my catch-all drawer, I found a half-inch leather strip, and an awl. Except for a little emergency sewing, and making a couple of crude holsters and sheaths years ago, I had never done any leather work. But, probably by absorption from the pages of Popular Science, I knew you could wet leather, push it around with a blunt instrument, and thus impress a design. So, with my awl, a knife, a dull nail, and a kitchen spoon, I set to workâ€”ably bothered by the boy. Here’s a picture of the result an hour later. It’s a “school belt” complete with alphabet impressed by said nail. The “carving” was done with the handle of the spoon. I made mistakes: getting the leather too wet was the worst. It should be dampened from the flesh side until the polished side darkens, I now know. In my ignorant enthusiasm I soaked it good. It isn’t going to put Sam Myers, down in Texas, out of the harness and holster business. But my son’s schoolmates are pestering their pops. And I guess it has put me in the leather-working business. I never knew it was so much fun and so easy to turn pennies of leather into dollars of value compared to “boughten” stuff. So now I’m shopping for leatherworking tools. In fact, if the fun isn’t enough to start you doing something with your hands, the high prices these days are a good reason for making what you can yourself. You will find many things around the house, especially the little luxuries, that cost too much to buy. You can make them, even with the high cost of materials, for half the price and less. All you need is ten thumbs and the urge. 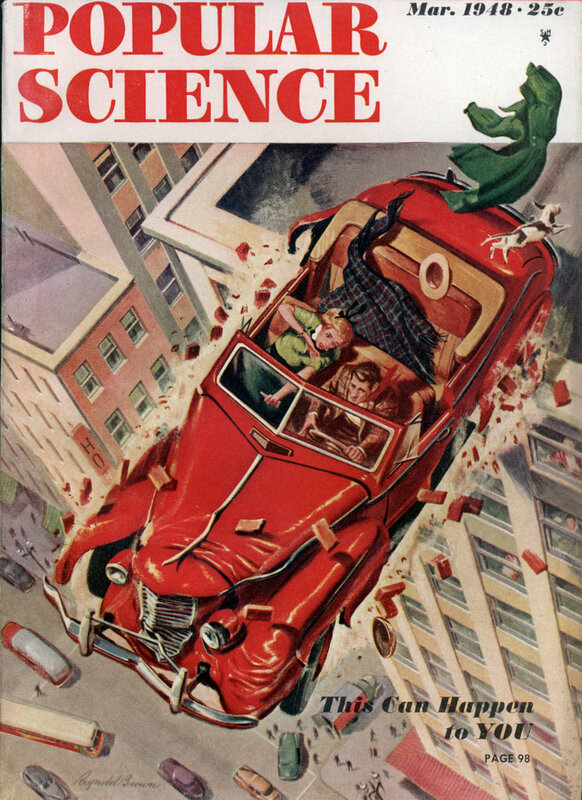 And Popular Science will supply the urge. Charlie, what is the story behind the cover? That’s not my idea of a flying car! It’s actually an article about good driving skills. That image is saying that driving into a wall at 50mph is like falling off a building. I’ll post it when I get a chance.